Does your cat seem to be going bald? What does that mean? Is he sick? Why is it happening? And what, if anything, can you do about it? There are, in fact, lots of reasons why a cat can be bald or suffer from hair loss or alopecia. Sometimes cats are born bald. Some cats, like the Sphynx, are born with hardly any hair. 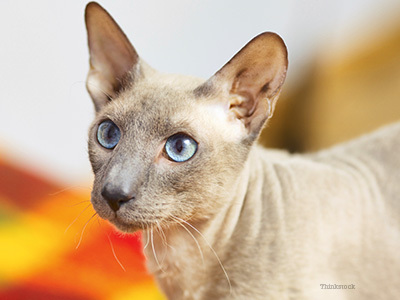 In these cats, the lack of hair is a genetically-determined and desirable characteristic among proponents of the breed. Some folks seek out this particular look in a cat just like others might prefer a long-haired cat over a short-haired. Sometimes feline hair loss is benign and temporary. There are also transient reasons for hair loss. Just like people go through stages where they lose more hair, cats do too. Shedding is a natural and normal process that can vary in degrees. Cats that are sick or stressed for other reasons (illness, fevers, respiratory infections1, pregnancy, etc.) can shed excessively. These are not conditions that demand treatment since the cat’s coat should return to normal over time. Sometimes the hair loss is medically important. It is important, however, to consult your veterinarian if you are noticing any changes in your cat’s coat or if he is developing bald areas. Sometimes hair loss is due to a medical problem that does require intervention since the underlying reason for it can cause more serious and systemic problems relating to your cat’s overall health. Your veterinarian will want to determine if your cat’s hair is falling out on its own or if he is scratching, licking or chewing the hair off as a result of some inflammation or irritation. This distinction can help to focus the diagnostic approach in your cat’s case. Generally, if your cat is actively causing the hair loss, you and your veterinarian will be looking more for causes of dermatitis or inflammation of the skin (like allergies) or for infectious diseases like bacterial, fungal or parasitic diseases (like acne/pyoderma, ringworm or mange mites). In these cases, the answer may be found through skin scrapings, cytology, cultures or allergy testing; and appropriate therapy can result in hair re-growth. In dogs, hormonal imbalance (underactive thyroid, adrenal dysfunctions, etc.) is a common cause of poor coats and hair loss, but these conditions are not as common in cats. Overactive thyroid (hyperthyroidism), however, does occur frequently in older cats and can cause coat changes2 as can almost any other systemic or metabolic disease; your veterinarian may want to do diagnostic tests to know for sure. Click here to learn how your veterinarian will test for hyperthyroidism. Sometimes the hair loss is psychological. That is not to say that it’s “all in his head” and that your cat isn’t really going bald. Rather it means that many cats become obsessive about grooming. Obviously grooming is a major focus of your cat’s average day, but cats exhibiting psychogenic alopecia can break off their hair right down at the skin and over large areas of their bodies – sometimes any and every place they can effectively reach leaving hair only on their head and neck. The compulsion may start because of some irritation to the skin (as above), and then potentially continue on habitually, even after the inciting problem has resolved. Other cats will groom excessively for solely emotional reasons – a change in environment, a new family member, or some other stress. Whatever the reason, this form of alopecia indicates that your cat is either physically or emotionally uncomfortable or unhappy, and every effort should be made to determine what the problem is and to correct it either with medical or behavioral therapy. In summary, hair loss or alopecia in cats can be just a cosmetic issue or it can be due to a primary skin problem. It can also be an external indication of a more serious systemic or psychological disorder. Consult your veterinarian as soon as you see any changes in your cat’s coat so the two of you can address the problem as soon as possible. 1. "Alopecia." THE MERCK VETERINARY MANUAL. MERCK MANUALS. 10 Nov. 2014. 2. Kennis, Robert A. "Feline Dermatology." Texas A&M University. June 2006. Lecture.